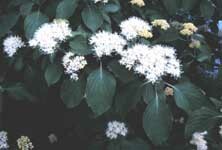 Pagoda Dogwood grows slowly at first but becomes moderate with age. The tree grows in sun or shade. The fall color is deep red and the white flowers are produced in clusters in the spring. Bluish-black fruit are produced after the flowers.